« ¡Feliz Día de San Valentín! When you first start learning Spanish you just need to learn a handful of verbs that will allow you to form the most important questions to express your needs and wants to get by. These include words like want, need, looking for, have. In this post we will look at how to express what you want in the present tense. 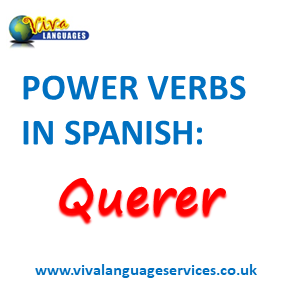 Notice that this is a stem-changing verb – this means the the middle “e” in the full verb “querer” changes to “ie” in all forms except nosotros and vosotros. If you are learning Spanish for South America or Mexico you will not need to learn or use the “vosotros” form as they do not use this. Instead you would use the “ellos” form to address more than one person. The reason the subject pronoun – yo, tú, él, ella, nosotros, vosotros and ellos is in brackets is because you do not have to say this as well as the verb. They are used if you need to emphasise or clarify who you are talking about or if you are changing subjects within the same sentence. (Yo) quiero un vino tinto. I want a red wine. You want to learn Spanish. (Él/Ella) quiere ir a la playa. He/She wants to go to the beach. We want to go out early. (Vosotros) queréis comer la paella. You all want to eat paella. (Ellos) quieren tomar el tren. They want to take the train. You don’t want to walk. She doesn’t want to swim. (Nosotros) no queremos un postre. We don’t want a dessert. (Vosotros) no queréis venir a la fiesta. You (all) don’t want to come to the party. (Ellos) no quieren cocinar la cena. They don’t want to cook the dinner. ¿Quieres ir a la piscina? ¿Ella quiere vender el apartamento? Does she want to sell the apartment? When do they want to return? Have a go at making up your own positive and negative statements as well as questions. This is the only way to learn and improve by putting into practice what you are studying or reading about.